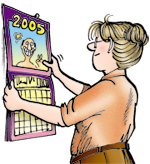 2019 01: Elly Gets Laryngitis | Storylines | FBorFW Strip Fix For Better or For Worse Comic Strip by Lynn Johnston. This entry was posted in Uncategorized on January 1, 2019 by stripfix. This entry was posted in Uncategorized on January 2, 2019 by stripfix. This entry was posted in Uncategorized on January 4, 2019 by stripfix. This entry was posted in Uncategorized on January 5, 2019 by stripfix. Lynn's Comments: I think I've said before that my mother was the ultimate "home remedy queen". If any of us was under the weather, we'd run for cover knowing--if the illness didn't do us in, her potions, unguents and cures certainly would. What I find distressing now is the ever increasing and bewildering choices we have to make when trying to find any over-the-counter pain relief. It immediately makes me want to go back to the remedies my mom pulled out of her hat! This entry was posted in Uncategorized on January 7, 2019 by stripfix. This entry was posted in Uncategorized on January 8, 2019 by stripfix. Lynn's Comments: Once again, I received letters from folks who thought the mere suggestion of an “obscene phone call” might rattle the minds of my young readers. 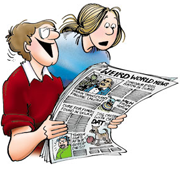 I now wonder how much the kids of today have already observed, experienced, and come to terms with by the time they are reading the funny pages! This entry was posted in Uncategorized on January 9, 2019 by stripfix. This entry was posted in Uncategorized on January 10, 2019 by stripfix. Lynn's Comments: This was a true story. I did post notes to the family in lieu of nagging…and the notes worked! This entry was posted in Uncategorized on January 11, 2019 by stripfix. Lynn's Comments: My husband said this, and it was a good thing. I was too miserable to write and I needed some good material! This entry was posted in Uncategorized on January 12, 2019 by stripfix. Lynn's Comments: This happened! When my well-meaning kids decided to make mac and cheese for dinner, they put on the macaroni without thinking to stir it. The result was a block of pasta that came out on the spoon like this. A good laugh means nothing is wasted. And, we had a dog. This entry was posted in Uncategorized on January 14, 2019 by stripfix.